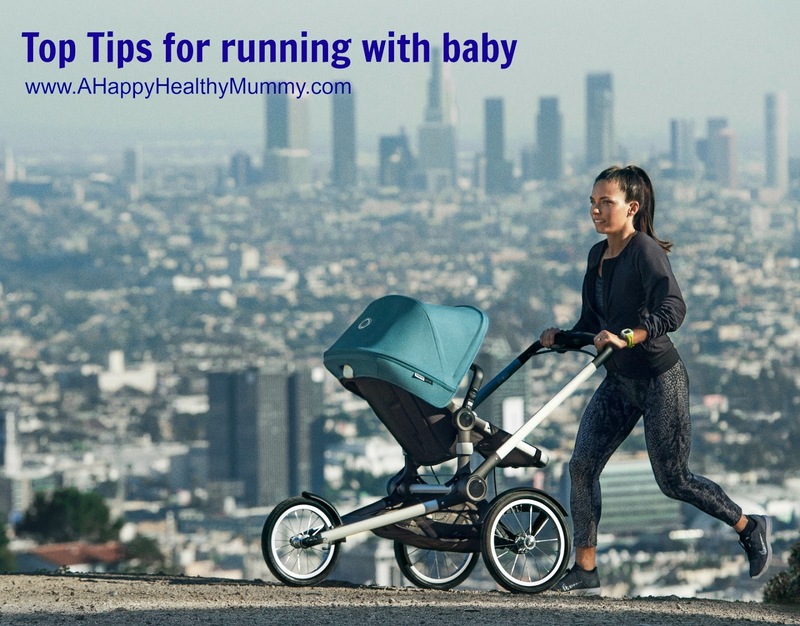 A Happy Healthy Mummy: Running with a buggy - the perfect combo! Running with a buggy - the perfect combo! One of the hardest times to look after yourself physically is when you have a baby in tow. Alongside sleep deprivation and weaning, dirty nappies and milestones it's difficult to prioritise your own needs - even though by the time your baby is nearing his or her first birthday you're probably keen to fit some me time into your life. And perhaps even hankering after a regular workout. But if you don't want to put your child into a gym creche or other care provider while you take time out - or if that's just not feasible - you can be left with very few fitness options. Which is why running with your child is such a great idea. It's free for a start - and a great way to fit exercise around a changing timetable as your baby develops. You can go alone - or with friends - and both you and your offspring get a healthy dose of fresh air and togetherness. 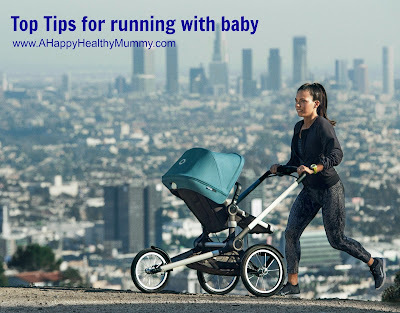 When I had my first daughter, specific running buggies were still a relatively new concept in the UK - and I was only dimly aware of organised running groups catering to mums and babies. I certainly knew my very basic pushchair wasn't up to the job! But times have changed - and there's plenty of models and advice out there to help. In terms of safety you need to buy a buggy that's designed for running (it should have large wheels, a hand-operated brake and a five-point harness to keep baby in place not bouncing about all over the place). Babies should be able to sit and hold their heads up independently before you even think about a jogger. You'll also need to check with your GP if you have any specific health concerns of your own (pelvic or back issues) and build up your distance gradually, monitoring your baby to check they are enjoying the ride. You'll also need to ensure that you protect your passenger from the elements - including the sunshine and colder weather. Running with a buggy will likely affect your running style - and you need to make sure you don't strain your arms and shoulders by pushing down too hard on the handle. To improve form relax your shoulders and concentrate on your posture. You'll find running to the side of the buggy rather than behind it is easier. Running in open areas, away from traffic and with wide pathways with good visibility is also advisable, with smoother ground all the better for your little one. Make sure you are clearly visible too - especially if you are running in restricted light. 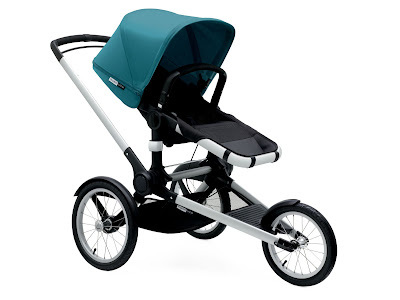 The latest model to market in this arena is the Bugaboo Runner, which launched at the beginning of June. You can buy just the chassis and adapters if you already have a Bugaboo (£349) - or buy the Bugaboo Runner complete (£583). Features include the all-important air-filled tyres (16-inch rear and 14-inch front), a fixed front wheel for a smooth and stable run and an advanced suspension system to absorb any bumps along the way. You also get a five-point harness and an easy access speed-control brake along the entire handlebar and a light fixed wheel base that allows for easy steering. There's a height-adjustable handlebar (so mum and dad can adjust to fit! ), a handy under seat basket and mud guards (well this is England, you're probably going to experience some inclement weather!!). The Bugaboo Runner is suitable from nine months (until 17kg and/or a height of 102cm) - and when your child is old enough (18 months) you can switch from parent-facing mode to allow them to look out at the world. What a great way to see the world together! That is an awesome thing for people who can't go for a run just because they can't leave their little ones at home. I know a few people who would absolutely love this idea. Bendy, stretchy children for summer! Camping - the healthy holiday!